The Sonoran Desert, a collection of vastly different biomes, stretches from the tip of Baja California to Prescott, Arizona, covering an area of 100,000 miles. Spiders are among the many life forms that this relatively lush desert supports, some of them known as the most venomous in North America. 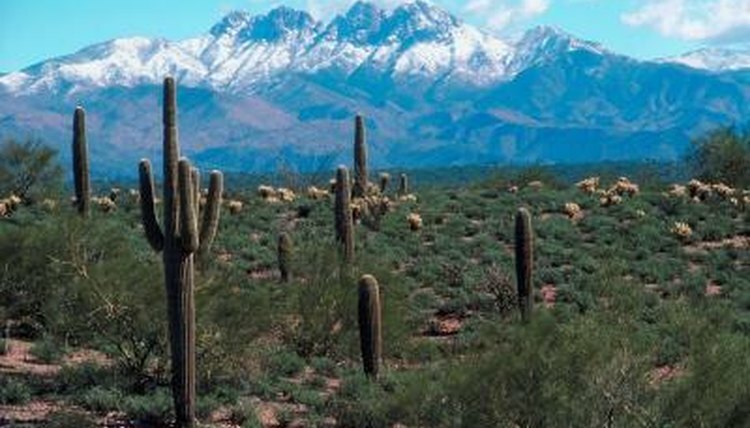 When visiting the Sonoran Desert, easily-made precautions can prevent painful encounters with these local residents. So named for its preference of avoiding human contact, the brown recluse spider prefers to nest in dark, undisturbed areas. They venture away from their nests at night to hunt, and may seek the shelter of an abandoned toy or clothing pile during daylight hours. These spiders consume cockroaches and crickets as well as other soft-bodied prey, usually retreating to their nests before the sun is on the horizon. Chance encounters with the spiders can be avoided by thoroughly shaking out clothing and shoes before attempting to put them on. Desert recluses have only six eyes, like their brown recluse cousins. Other shared characteristics include the characteristic "violin" shape that marks the spider's back, though this may be less distinct in appearance on the desert recluse spider. These spiders can reach 1 1/2 inches in length and are usually yellowish-tan to brown in color. Their legs are long and thin, having no spines. The venom of these spiders is necrotic, causing the flesh around the bitten area to rot. Victims of these kinds of bites should seek medical attention. Black widow spiders are the most venomous arachnids in North America, although only the females bite. Easily distinguished by the red "hourglass" pattern on the spider's abdomen, they can be 1/2 inch in length and spin a web that is erratic in appearance, though their silk is stronger than almost any other spider. Insects caught in the web are eaten as prey. The black widow spider prefers to spin her web on the underside of plants or rock formations and may bite when disturbed. The toxin these spiders emit is a nerve poison that must be treated by a doctor, but is rarely fatal. Fortunately, the bites of the black widow spider and the members of the recluse family are rarely fatal. They may, however, cause discomfort including fever, nausea, and in the case of the recluse spiders, necrosis of the flesh. Most spider bites will not immediately cause their victims pain, though complications may arise at a later time. For recluse bites, the website Desert USA recommends basic first aid R.I.C.E. therapy: rest, ice, compression and elevation. Black widow bites can cause painful muscle cramping and should be thoroughly cleansed, followed by the use of an ice pack to prevent swelling. The local poison control network can advise concerned citizens of the best course of treatment for spider bites.